The DataCal Urdu Labels+ Keyboard is an English (US) keyboard with Urdu language labels already installed for you. This creates a high-quality, durable, bilingual keyboard that is ready to use out of the box. 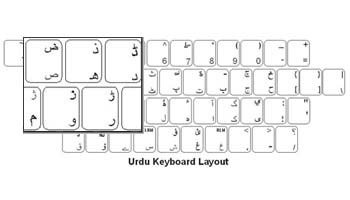 The Urdu Labels+ Keyboard conforms to the keyboard layout in Windows XP. The language labels are already installed on the keyboard for your convenience. You simply plug the keyboard into the computer, configure your version of Windows for Urdu, and start typing. This label supports the keyboard layout for: Urdu. This language is supported in Windows Vista and XP. The Labels+ Keyboard is an economical option for a bilingual Urdu keyboard. The letters are printed on the underside of the labels so that the lettering will not wear off. This affords you with many years of durable use.